The University of Strathclyde was established more than 200 years ago and is renowned for excellent teaching, research and strong links with industry, government and business. The student population is around 21 thousand (in 2014/2015 intake). The university has more than 400 degree courses across areas of expertise in business, engineering, science and humanities and social sciences. 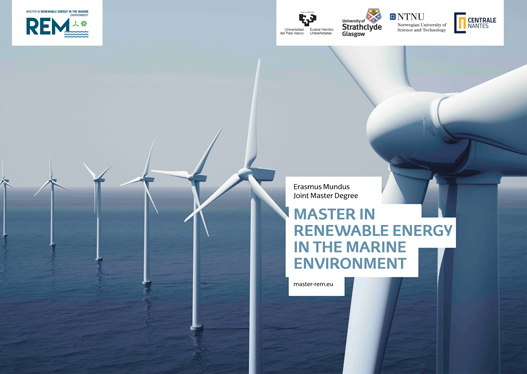 The Strathclyde’s Departments in REM will contribute with their strong expertise on power system operation and control with large penetration of offshore renewable technologies such as wind, tidal and wave. Modules delivered will cover energy technology, wind turbine dynamics and modelling, aero-elastic simulation, wind turbine control, aerodynamics, wind turbine condition monitoring and diagnostics, wind power integration, grid-connection, wind farms and offshore systems, offshore structures, fixed and floating, fatigue and damage detection. The wind energy and control centre (WECC) at Strathclyde University has approximately 80 researchers and 10 academic staff. The research covers all aspects of wind energy with particular strengths in wind turbine control, grid-integration, offshore power networks, wind turbine condition monitoring, asset management, floating and fixed support structures and wind turbine design. The group, has a current portfolio exceeding £10M, including the EPSRC funded Centre for Doctoral Training in Wind Energy Systems. Research is supported by EPSRC, DECC, the Scottish Government, EU and industry. It leads or co-leads many of the relevant EPSRC Supergen consortia including Wind Energy Technologies. In addition, it is a member of the Supergen Energy Infrastructure and Marine consortia. European research grants of relevance include DOWNVind (on offshore wind power), DISPOWER (distributed power systems), InnWind, DTOC, WindTrust and IRPWind. Active research programmes exist with Gamesa, Rolls-Royce, Scottish Power, Scottish and Southern Energy, National Grid, EdF, E.On, ABB and British Energy.